SILICON SLOPES, Utah – July 25, 2017 – Domo today released its “Data Never Sleeps 5.0” infographic, the fifth annual iteration of this informative visual report that provides insight into consumers’ online behavior. The infographic details how much data is being generated on the internet every minute across popular applications and platforms, including Snapchat, Instagram, Amazon, Twitter, Netflix, Spotify and more. 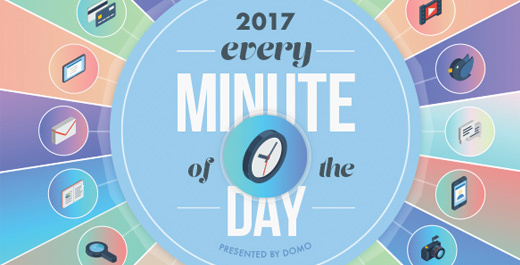 Domo first introduced the “Data Never Sleeps” project in 2013, as a snapshot into the volume and velocity of data being created and shared online. According to reports, 90 percent of all data was created in the last two years. That’s 2.5 quintillion bytes of data per day. This years’ edition shares the latest stats on the growth of data in the digital sphere and where it’s all coming from, highlighting the world’s obsession with social media, text messaging and The Weather Channel. Text is the new talk. The previous report found that more than 3.5 million text messages were sent every minute. That’s miniscule compared to the 15.2 million texts sent per minute today, a 334 percent increase. The number of gifs sent has also increased, rising from 569,200 to 694,400, a 22 percent increase. The digital era requires internet data usage. Amazon, YouTube and Netflix are some of the biggest users of internet bandwidth. With more and more streaming services, internet data usage continued to climb. On average, American’s used 2,657,700 GB of internet data every minute. Snapchat is currently the preferred choice for the social media savvy. Snapchat users shared 527,760 photos every minute. That’s significantly higher than Twitter’s 456,000 tweets or Tumbler’s 74,220 published posts. Forecasting the weather, rain or shine. Even in the digital world, people want to know whether the weather is good or not. The Weather Channel received 18 million forecast requests online, a 22 percent increase from the previous report. Users are cutting the cord on Netflix. As cord cutting increases, you would expect Netflix viewership to go up, but that’s not the case. On average, Netflix viewers watched 69,400 hours per minute, a 20 percent decrease from the previous report.